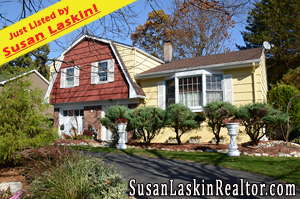 Bergen County Real Estate - Hillsdale Sugar Maple Split! 352 Magnolia Ave in Hillsdale, New Jersey ($482,950!) is a stunning Sugar Maple Split Level w/ a circular driveway located on a beautiful residential street. This home boasts an updated Eat-In Kitchen w/ beautiful wood cabinetry, a large Formal Living Room w/ hardwood floors & large bay window, a Formal Dining Room, and a large Entry Foyer. There are also 3 spacious bedrooms, 2 full baths and an attached on car garage. With a new dimensional roof, central A/C and close proximity to the picturesque town center (with upscale restaurants and shopping), this home has incredible value! Learn more about Hillsdale, New Jersey! Browse through more Featured Hillsdale & Bergen County Real Estate!